Availability Search 1.5 has just launched! Contact us if you have any issues or suggestions ? Would you like your customers to be able to see your products based on their available date? Check out our Availability Search plugin, it’s made for WooCommerce Bookings! Now your customers can input their chosen date and search first for all the available bookable products within the date range! 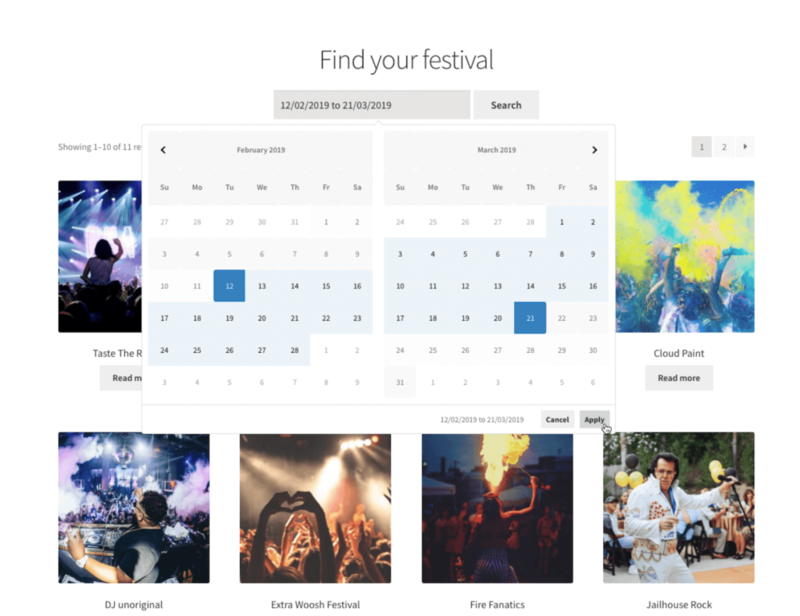 Works great for holiday and accommodation bookings, event bookings, and rentals. Our Availability Search for WooCommerce Bookings Plugin makes the search easy with three simple steps! Book the days that you know are available! Due to popular demand we’ve made Availability Search compatible with translations. You can now translate the weekdays, months, buttons and date strings using either third party translation plugins or simple filters. Take a look at our documentation to read more about translating the Availability Search with translation plugins or using simple filters within your child theme or custom plugin. We also support custom date formats. We believe that accessibility should fluent and seamless. Mobile friendly sites are more important than ever. It’s a must to keep your customers happy while they browse your store as well as for your site’s SEO. Google puts heavy weight on mobile friendly sites. So our date picker is no different! Yes, you can use our Availability Search with WooCommerce Accommodation Bookings. It works straight out the box without any further configuration. Keep in mind that the current version of Availability Search only supports days (not time slots). Just drop the [availability-search] shortcode onto any page and you are ready to get started! Depending on your business and customers, you might want the search to behave a certain way. 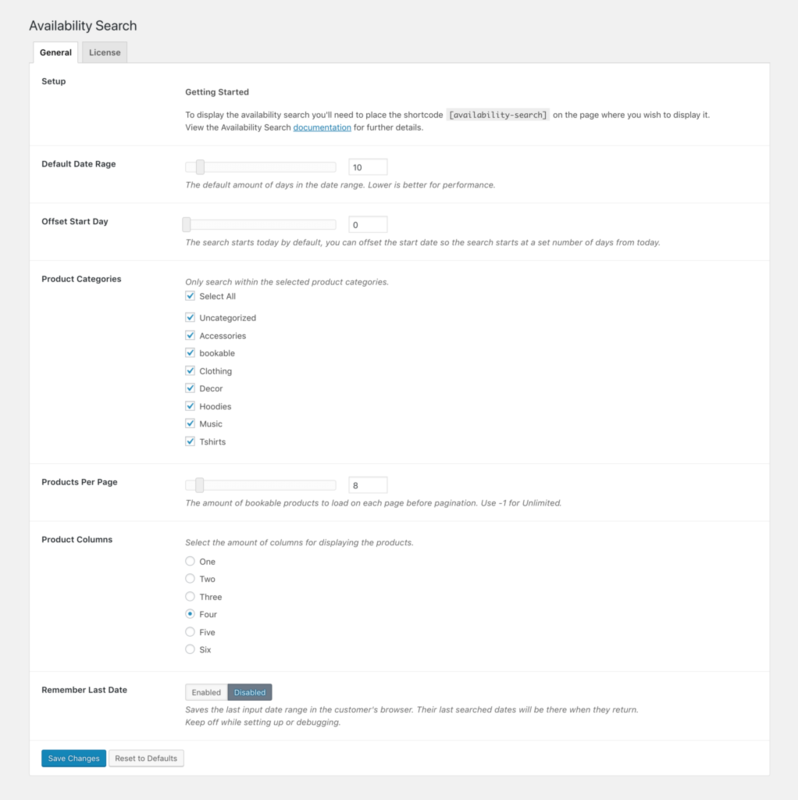 Availability Search for WooCommerce bookings comes with 2 search types, which you can select in the settings. Flexible shows bookable products that are available at any time in the searched date range. E.g. 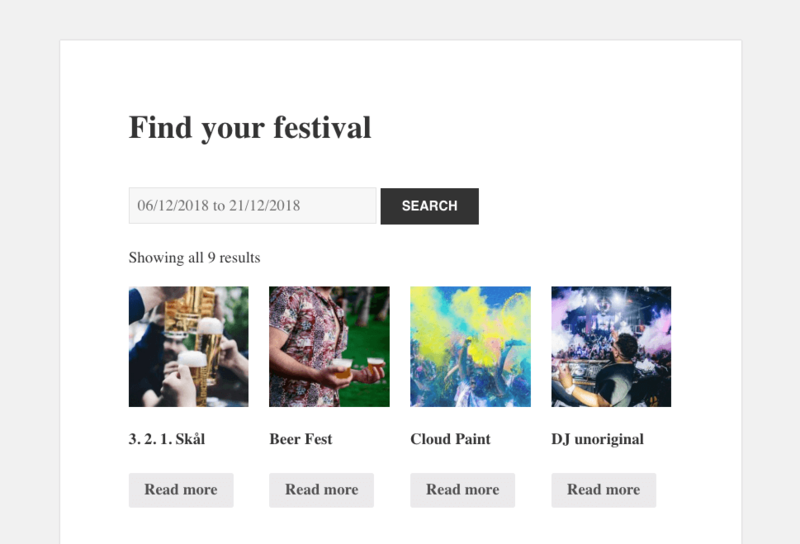 if you’re selling a tickets to a festival which is on the 15th, then it will appear if the customer searches from the 1st to the 30th. Strict will only show bookable products that are strictly available for ALL days in the searched date range. Use Strict if your customers need to book your products for very specific dates. E.g. if your customers are booking a hotel stay and they search from the 1st to the 4th, your bookable rooms will only show if they’re available for all of the dates selected. Do you have some products which shouldn’t appear in the search? Don’t worry you can select the specific product categories that you want your customers find in the search. Some WooCommerce Booking stores use buffer days between bookings, fear not! The plugin automatically detects those, as well as any date ranges that have been marked unavailable. The Minimum Bookable days settings from WooCommerce bookings are supported as well. Minimum bookable days work hand in hand with buffer days and unavailable days to find the next available day. Multiple bookings slots per products are supported. So if 4 slots out 5 have already been booked, then the availability search will still pick up the last available slot. The setup process is fast. Simply head into the settings page which is located under the Bookings sidebar menu. Click on Availability search. Choose your settings, and then grab the shortcode. Then just paste the shortcode on the page where you’d like customers to search for your bookable products. Need a little extra information? Head over to our documentation where you’ll find in-depth information about features, and ways to customise the Availability Search. There’s even example functions and CSS styling! We are excited about what the Availability Search can do for WooCommerce businesses and we want our plugins to be as flexible as possible. 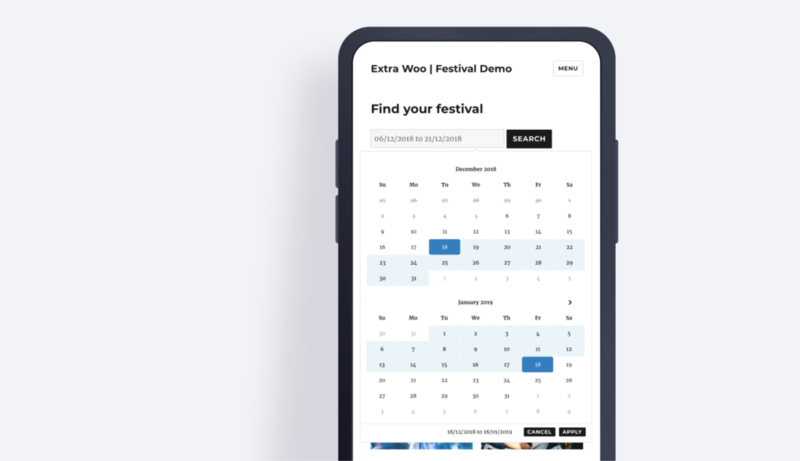 Our Availability Search for WooCommerce Bookings plugin makes it easy for your customers to quickly find available products on their chosen dates! Let us know your thoughts in the comments below or hit us up on livechat! Very good plugin, but it’s a shame that you can create one search calendar and it works globally (not suitable for multiple product pages). Hi Bart! Thank you for leaving a review! We are actually in the middle of working on features that might be just what you’re looking for. The update will include the ability to display the Availability Search in multiple places with unique settings, and optionally having customers choose which product category to search within using a dropdown next to date picker. Hopefully we can turn that 4 into a 5 star! ? Exactly what I was looking for. This plugin will save my customers a lot of time in order to book the products they are searching for there events. If you have any questions the support is extremely motivated and friendly! Was looking for a plugin that will search in Bookings with Fixed blocks of hours. finally found this plugin, simple and works! the developer is constantly developing and improving the plugin. Support is awesome! thanks! Fixed: A bug that caused the loading spinner to stay on the button. Fixed: An issue where the the settings would sometimes disappear from the page. There might be more to this, if it still happens then reach out to support. Search on page load a new the feature that lets you optionally turn off/on the automatic availability search when customers load the page. The Search uses the default date range, so your customers can book quicker. A lot of exciting changes this time around! Added: Single Date Mode. Customer will be presented with a single calendar where you select a single date, instead of having to click twice on the same day in date range mode. Added: Time support. Customers can now pick a time to search from. e.g 2 PM will display all available bookings at 2 PM and onwards. Added: Simple error codes to error messages. These show when no products are found in the search and are meant to be used by support. Fixed: in rare cases the date picker was blank/didn't open with cached sites. Improved: Timezone accuracy. The UNIX timestamp for the start and end date is being passed more reliably throughout the plugin. Improved: Loading speed and cache compatibility, better handling the structure of files that are being enqueued. 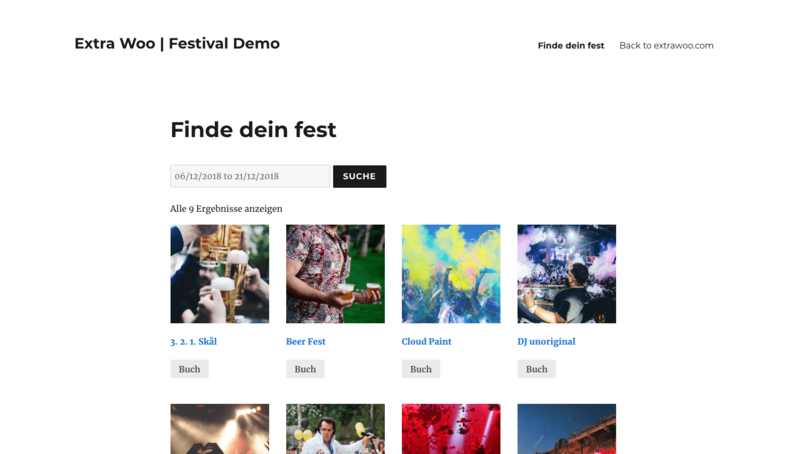 Tested with the production version of WordPress 5.0 and Gutenberg. Fixed: Strict Search - Products with resources are now included in the search as well. Flexible Search already did this. Fixed: Strict Search - Now checks correctly for the availability if the start and end date is the same. e.g a single day availability search. Fixed & Improved: The date picker now looks correct on the Storefront Theme, and should behave consistent across themes. New: Added support for WooCommerce Accommodation Bookings add-on ? New: You can now format your dates in any way. MM/DD/YYYY as an example. See our documentation for a full range of examples. Improved: Frontend CSS styling is now enqueued for better handling. Fixed: An issue where the Search and Date Picker would always be at the top of the page regardless of where the shortcode was placed in the content. Fixed: Lari spotted and fixed a few typos on the settings page. New: LTR, Center & RTL Layout options now available from the settings. New: The date picker weeks now automatically starts with your WordPress default Week Day. Fixed: Stopped mobile keyboards from popping up when the date input is selected. Massive update with a improved date picker, translation ready, & stability changes! ? ? New: Fully Translatable date picker and frontend messages! You can now use your favorite translation plugin like WPML or Loco Translate, to translate the strings into any language. New: Filters for translating. We have also added some handy filters if you prefer to use those. Read more in our documentation. Improved: We have a new Date Picker which simplifies the way customers pick their dates. We got rid of the 2 date boxes and replaced it with one! Now Customers can select their start and end date using a single date picker. It shows a range instead of picking two single dates. Improved: Error handling when customers choose dates where no bookable products are available. Improved: Product column should work better now across themes. Fixed: a bug that caused Pagination to display the second page wrong. Improved: Pagination now makes use of your theme's WooCommerce pagination styling to keep your store looking schmick. Improved: We have improved selector names by making them more unique. It lessens chances of conflict between themes/plugins. Fix: Submit button was unresponsive on some site with specific versions of jQuery. jQuery function .live replaced with .on for better compatibility. Initial release! Availability Search for WooCommerce Bookings had launched on https://extrawoo.com ?